How do they fit so much into such a small box? 38 preset patches (user editable) using 56 types of effect variations. Line in allowing Center cancellation and pitch shifting. LCD display with Back-lighting (use optional). The unit appears to primarily be pitched at home users and offers a 'one-stop' shop for effects. The effects are mostly bias towards different types of distortion, although there still are plenty of 'clean' sounds too. If you don't like a patch you can edit it anyway. There is some background noise on some of the louder effects but it is shut out as soon as the sound stops so doesn't detract from the overall effect. Obviously in such a small unit there isn't a foot switch so you are unlikely to want to gig with this. What it does offer is a headphone out socket so you can practise your choppiest riffs and wildest distortions over and over without anyone even realising you're even playing the guitar! 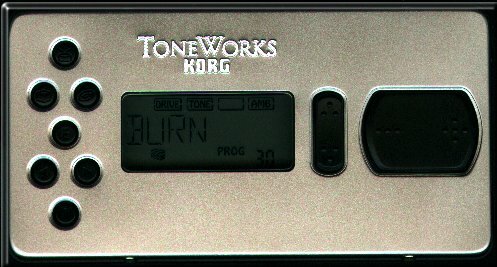 The editing on the unit is easy, with the LCD display showing which group of effects you are editing (Drive/Tone/Modulation/Ambience). You can even choose the generic type of amplifier you want it to sound like (Combo1/2 and Stack 1/2) although this effect isn't that noticable. The drum (or rhythm) feature is the weakest feature of the unit. The drums sound lifeless with far too much treble. The patterns are non editable and of limited appeal. There is no sequencing function, but it must be remembered that this is a guitar effect unit and not a drum machine, so this feature should just be regarded as 'added value'. The tuner is really neat. It show the note being played and a bar which is either above (sharp) or below (flat) the note being played. Really accurate and quick to use. Overall then, a great little unit, ideally suited to the bedroom guitarist or home 4-tracker, quite expensive when compared to the ZOOM 505 , but great if you don't want to annoy the neighbours (or your nearest and dearest). Also the unit is so small that it easily fits into a guitar case pocket. The battery life is good (and is improved iif you don't use the LCD backlight) at somewhere around 10 hours on Duracell type batteries. 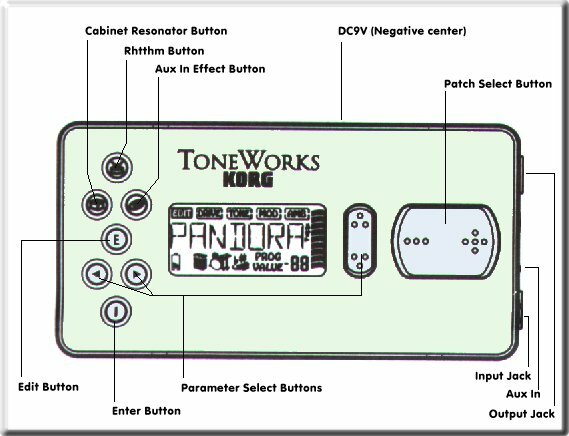 I am planning on starting a patch database for the Pandora PX2 so if you have any patches then E-Mail them to me and I'll include them (with a credit) on this page.